Review Apple takes great pride in shipping macOS annually, as regularly as clockwork. Only a few macOS updates have failed to arrive in the window between July and October each year – and those were a very long time ago. 10.4 Tiger, which followed its predecessor by 18 months, arrived while Microsoft was in the middle of its Longhorn agonies, the six-year lacuna between XP and Vista, with Apple taunting Microsoft: "Redmond, start your photocopiers." For the last five years a new macOS has arrived in September or October, come rain or shine. But this year, I think it would have been smarter to wait, as the really big feature is not yet ready. You can think of Apple's annual Mojave macOS update as either a holding operation, or the first step of a journey for developers that merges the desktop and mobile operating systems. Apple would prefer you to think the latter. Last year El Reg described macOS 10.13 High Sierra as the biggest upgrade for years, despite having no new user-facing features. 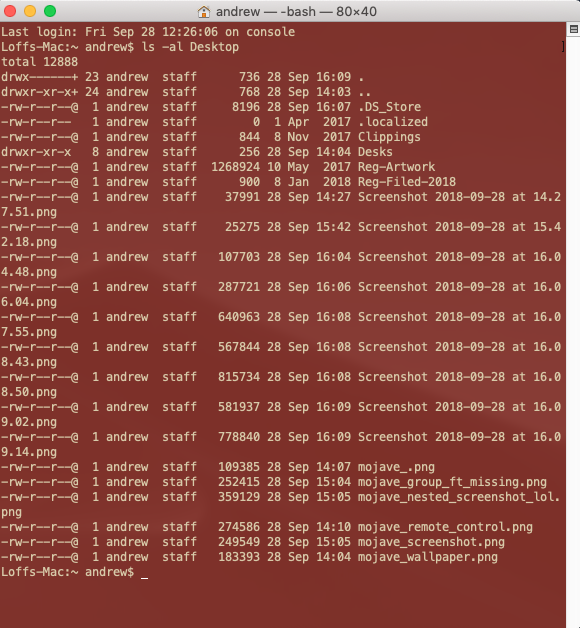 That was because Apple introduced its first new file system for two decades – APFS – as well as new file formats that became the default in the Apple universe. The consumer tech press yawned at the lack of gimmicks and eye candy, but we thought it was excellent work. Like 2009's Snow Leopard release, all it did was improve performance – and there were no stupid ideas from the marketing department, or a random user interface designer randomly pulled in off the street and given the job of masterminding the release. This year's big-bang feature is the introduction of APIs bringing macOS and iOS closer together. But they're not ready yet. It doesn't even have an official name – we'll call it Marzipan. So Apple is shipping macOS anyway, bang on time, merely promising that these "additional frameworks" will be available "starting in late 2019" ... "providing new opportunities for developers and creating more apps for Mac users to enjoy". 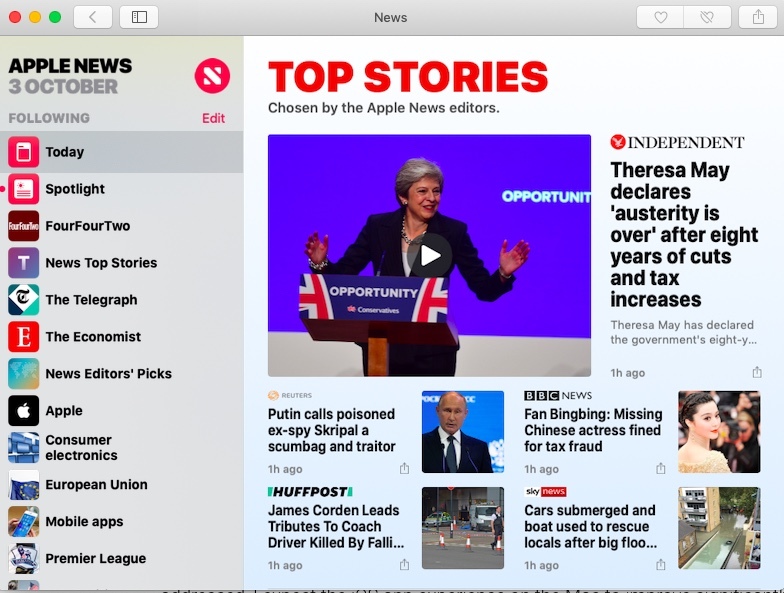 Apple has included four iOS apps bundled with macOS: Stocks, News, Home and Voice Memos, but you can't write your own. Running mobile apps on Macs signals a major shift in future strategy, and a pragmatic one in a mobile-first world. For heavy-duty apps developers will have the Cocoa APIs, preferably writing in Swift. New apps are mostly written for iOS and Android first – touch-centric systems – and the new APIs give them some portability so they can run on non-touch systems. The desktop is now legacy, Apple is saying. But sacrificing the legacy isn't something others are keen to do. Microsoft has been flailing around for years trying to find the solution – Silverlight, then UWP, now PWAs. How does it look? Smart but not quite Mac-ish. iOS ports are restricted to one window, and the lower screen density of older (non-Retina) Macs has obliged the designers into making some choices on fonts and spacing. Here's the News app. 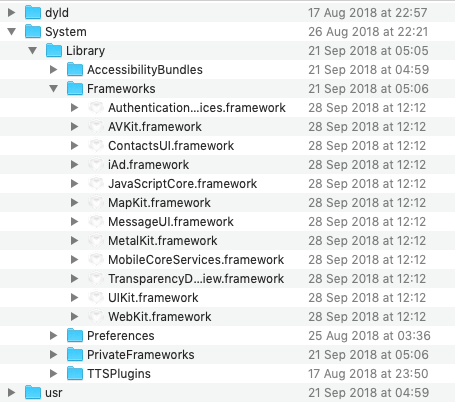 It still looks and feels a little out of place – although not as much as applications generated by so many cross-platform toolkits over the years. Only Qt has really cracked it, generating many popular applications that look plausibly "native". 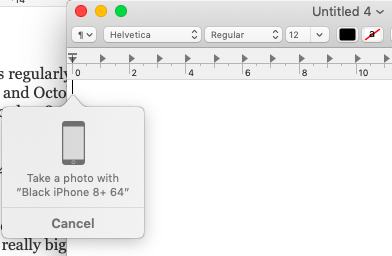 Damn it, Apple product managers must have thought. This year we'll give them some eye candy. And they have. So to the cosmetics. Mojave introduces a dark theme for goths everywhere. Apple has done a comprehensive job in contrast to Microsoft, which has made painful progress removing legacy control panels and dialogues – many are still as white as can be. The wallpaper changes according to the time of day – a cute gimmick – but only the wallpaper. There's no variation, just light or dark. To state the bleedin' obvious, whether you stick with it is down to taste, and how good it looks depends on your monitor. On my non-Retina MacBook Air, goth mode lasted less than five minutes. But as computer displays gain more TV features (the blacks get blacker) and a wider, richer colour gamut, goth mode will look less contrived than it does today. I blame The Matrix for starting all this off, by the way. Stacks is a feature Apple patented more than 25 years ago (as "Piles", not a great name) so it has spent a lot of time deciding what not to include. It's a great idea – a kind of smart folder which reduces desktop clutter by organising files by type or content. This virtual folder pulls in files so they don't clutter the desktop. I know people who never, ever use the file system – the desktop becomes a grid of hundreds of saved documents, screenshots and downloads. Every year I'll go along and put them in a folder called "Things that were on the desktop". 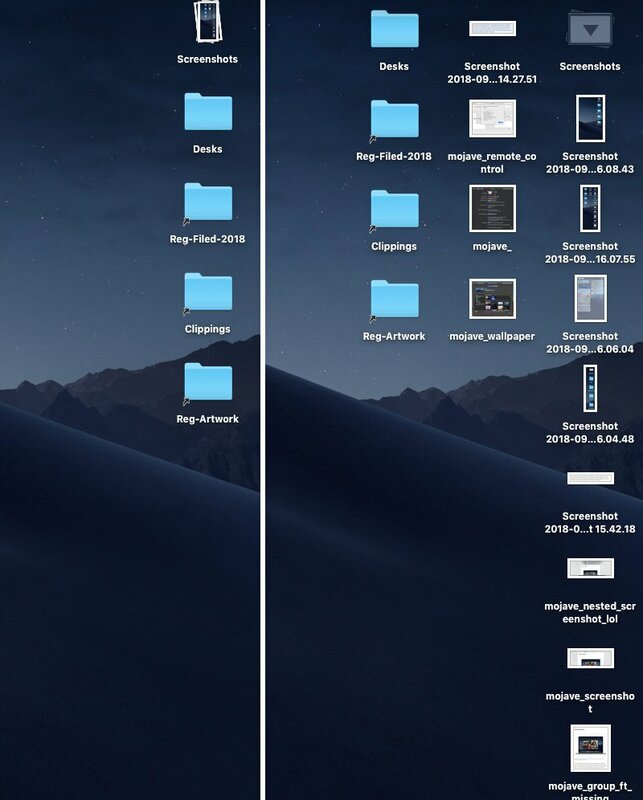 These users tend to make use of Spotlight to find things, and the Recents view (until last year this was called "All My Files") so it isn't as pressing an issue as it used to be. But there are still potentially many users who could find it useful. As Cult of Mac reported yonks ago: "Piles have been among the most-requested UI features among Mac-heads for more than a decade now." The patent (PDF) was filed in 1992 and renewed in 2006, so Apple was keeping its options open. 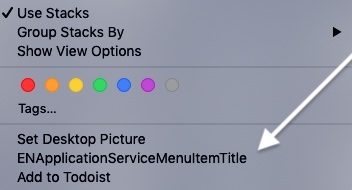 But after using the Stacks feature on Mojave, I can see why Apple didn't include it. For power users it's really nice to have. They can set up sophisticated smart folders on the desktop – but these don't move or hide files. That's where the problem comes in, for Stacks appear to move things when they don't. For utter n00bs, it's potentially confusing. Take this scenario. I created a Stack for Screenshots, and then moved three items onto my lovely pristine desktop. Only one appeared. That was odd, I thought. I called up an Undo, and then one disappeared. Then a Redo. Suddenly there were many more files on the desktop than I had ever put there. What was happening? Well, the Stack was a screenshot Stack, remember, and only one of the three files was a screenshot. But the Redo emptied the Stack putting lots of screenshots on the desktop. Of course these only appear on the desktop when the Stack has been "opened", but the terminal confirmed that they haven't moved at all. So a Stack is something that looks like a folder but doesn't exactly behave like one. Really this presents an information problem for the user, one which needs visually differentiating more clearly. You can see there's an arrow on the Stack (top right hand corner) indicating it's open. I saw it too, eventually. This should be clearer, and something should visually distinguish files from an "emptied-out Stack". There's a grab bag of useful features smuggled into Mojave. If you have an iPhone, the relationship between Mac and phone has got a lot closer. Continuity Camera lets you call up the iPhone's camera from the Mac app you're using and insert a picture. Once inserted, you can then apply some plugins: Markup is bundled by default, and Mojave found OneDrive there too. But what happened in practice? Well, the iPhone could only take a Photo in one restricted mode - Portrait or Panorama, or any other of the usual settings weren't available. And, of course, the photo once it splashed into the TextEdit app was gigantic - but resizing it wasn't an option. So it's a terrific idea but needs some tweaking to make it more practical. The Continuity Camera works for scans too, and will straighten and crop images – which is promising. I'm less keen on the new, richer screenshot functions than most, I suspect. I've used the same key combinations forever, knowing that the grab will go to the clipboard or on a file. Mojave won't do this automatically as it introduces an intermediate stage, which requests user intervention, and an extra click. If you wait long enough it goes away. Oh, and the intermediate stage doesn't have a resize or resample option. Ho hum. Can you tell what I've done below, dear reader? Finally – this is not a comprehensive list – the security controls have been improved. 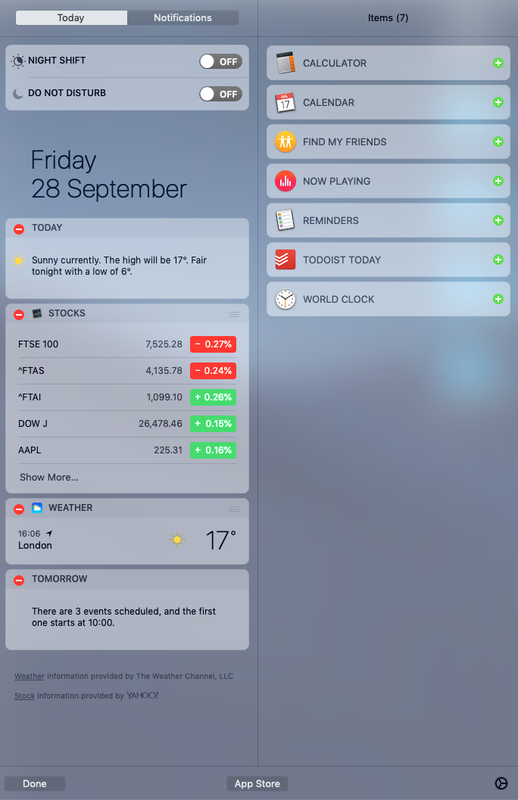 It's now closer to what you expect from a mobile OS, with much more granular access to personal data now under the user's control. 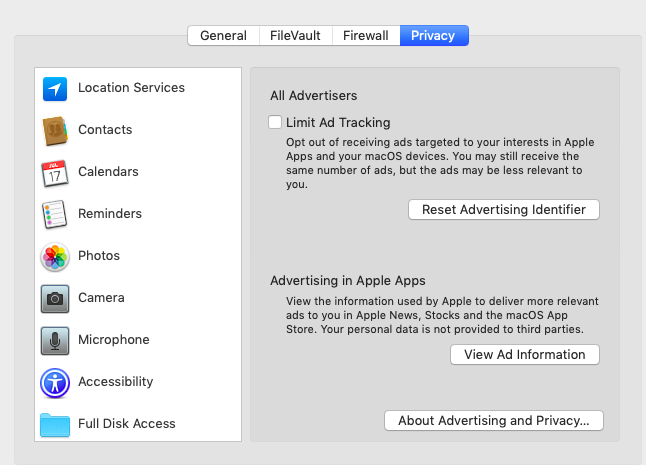 So you can see which apps request access to your Calendar, Contacts, Photos, Reminders, Camera and Mic, Automation, Apple telemetry data and advertising – and send them packing if you wish. Just imagine being able to refuse Microsoft access to telemetry data and refuse Google ad tracking. It's not going to happen without legislation, but wouldn't that be interesting?